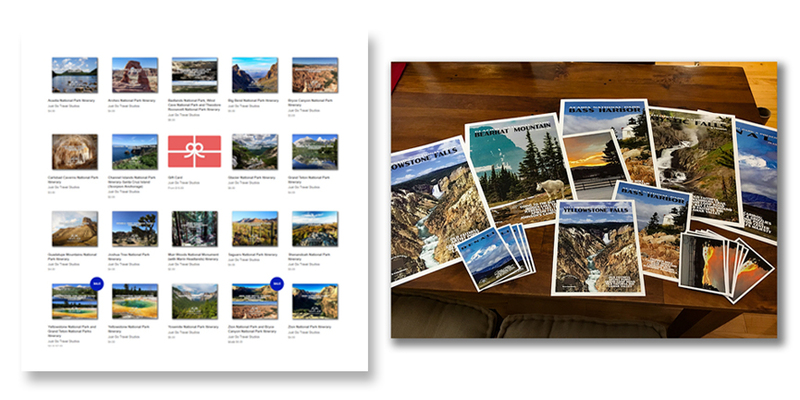 50% OFF your first National Park Itinerary Order (choose as many as you want, all at 50% OFF!) PLUS Enter to Win! One free Custom Poster or Postcard Set. We choose one lucky winner from our email list each month! We'll also send you our 5 GREAT ITINERARIES and other great content to get you started on road trip planning! Winners of the custom poster or postcard set will be contacted after the monthly drawing. We'll then ask you to send us a photo and we'll work with you to customize the exact wording that you want! Enter to Win! One free Custom Poster or Postcard Set. We choose one lucky winner from our email list each month! We'll also send you our 5 GREAT ITINERARIES and other great content to get you started on road trip planning! Winners of the custom poster or postcard set will be contacted after the monthly drawing. We'll then ask you to send us a photo and we'll work with you to customize the exact wording that you want! By checking this box, you consent to receive periodic emails for new product and blog announcements, promotional emails related to your purchase history, website browsing activity and/or interaction with marketing materials. The "All" label is used for tracking purposes. Get your 50% OFF itinerary coupon now!